Yellowstone National Park and Portion of Yellowstone Forest Reserve. Topography Sheet XVI. 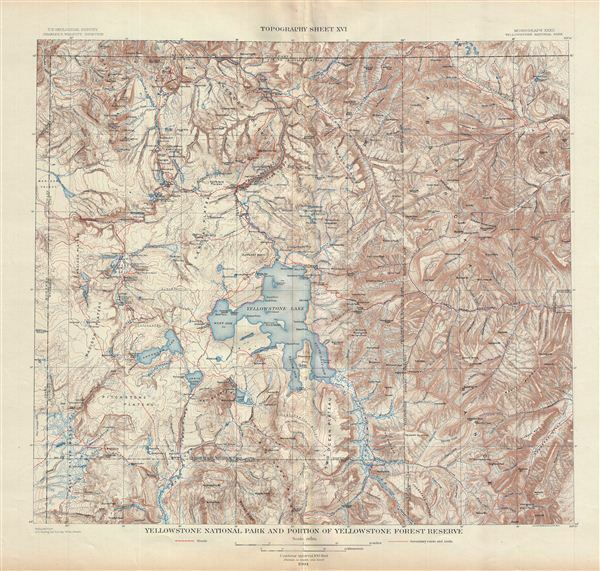 A fine example of Arnold Hague's 1904 topographical survey map of the spectacular Yellowstone National Park, Wyoming. Centered on Yellowstone Lake, the map covers the entire park as well as the adjacent parts of the Yellowstone Forest Reserve. This particular map was part of Hague's study of the regions unique geology and the related geothermal activity. Trails and roads appear in red and the Continental Divide is noted. Throughout countless well known Yellowstone sites are noted, including the Geyser Basin, mountains, rivers, lakes, volcanoes, plateaus, and valleys. Published by the United States Geological Survey in 1904.